Today, I took six students to the Reischauer Speech Contest in Okayama. Three students participated in the recitation contest. Three students participated in the original speech section. Two second grade students and one third grade student participated in the recitation contest. In the original section, I had one first grader, one second grader and one third grader. Now, some people have pointed out that a there was a FOURTH Seishin student listed in the original speech category. However, this particular student delivered that particular speech LAST year at the 49th Reischauer Contest (when she was in second grade). This year, she is in the third grade and delivered a new and very different speech at the Joto High School Speech Contest (where, I'm happy to say, she won first place). I think the entry was simply left over from last year's program. At this year's Reischauer contest, our Seishin girls, in my opinion, did a wonderful job. I'm very, very proud of all of them. Our girls in the recitation contest unfortunately did not take home an award, but it was a very tough contest with a lot of very great recitations, and even though our girls didn't go on to the final round, I'm still very, very proud of all three of them. In the original speech category, my first grader came home with fourth place, and my third grader came home with first place. My second grader, unfortunately, did not go on to the final round, however, she tried her best and gave her best performance so far. I'm so very, very proud of all them. Not only our own Seishin student, but many other students from the other schools also did a very good job. I was amazed at what a high-level contest this was. The participants demonstrated a tremendous amount of effort. I have judged a number of contests myself, and I have delivered comments at many of the contests I have judged. In giving comments to the audience and participants, I believe it is valuable for the judge to explain the judging criteria, and for the judge to offer suggestions on how to improve the speech and performances. However, I feel that one mistake I've made in giving comments is that I've spent far more time and energy on what I felt were the weaknesses of the speeches than on the strengths of the speeches. I think that quoting a speech and talking about why that speech was good, and why the quoted portion of the speech made that speech a WINNING speech is far more persuasive than the huge downer of subjecting an audience to a detailed description of their perceived failures or weaknesses. I feel that this is certainly something to think about because people like to hear what they did right far more than what they did wrong, and a positive atmosphere can be very constructive.. Of particular note, I strongly feel that we judges, if we are going to quote a speech, should never do so in criticism. I feel that would be cruel: to shame a young person by publicly telling the audience why that particular speech was weak. So, I think it's important for judges such as myself to be positive in our comments, and in praising the speeches to be as specific as possible. Such a reward, I think, would be very special to those whose speeches were quoted in praise. Furthermore, I think that when judges such as myself give advice about speeches, or wish to talk about perceived weaknesses in the speeches, we should keep our comments as general as possible so as not to single anyone out or cause them to feel ashamed. This is something I certainly plan to keep in mind in my own comments from now on. Again, I am extremely grateful to everyone involved in the Reischauer Speech contest for giving our girls the chance to develop their public speaking skills. Teaching pronunciation is very important in helping our students communicate clearly and effectively, especially in teaching them presentation skills. I bought this at ToysRus. It was in the educational toys section. It's a "Dental Model" by Edu-Toys. I removed the original plastic backing and replaced it with screws and springs I bought at TIME home center. This allows me to open it up. This was I can also fit my hand through the back and use my fingers to illustrate the position of the tongue. This is far more effective than using my OWN mouth as an example because it is much easier to illustrate the tongue position, and there's no 'icky' factor of looking intently into somebody else's mouth (not to mention the various dangers of halitosis, drooling, or spinach between the teeth!). In teaching pronunciation it is vitally important that the teacher understand the physiology of the mouth and how it is used to produce sound. In this way, it is very useful to know, understand and be completely comfortable and familiar with the International Phonetic Alphabet for English. 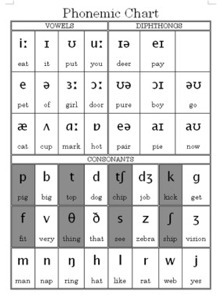 This is very good for teaching students the relationships between sounds, and it's very useful to understand the layout of the chart and how it corresponds to the mouth positions. It's really very logically set out. The vowels for example, from top to bottom are arranged according to how open the mouth is, while from left to right, they are arrange by shape of the mouth and the position of the corners of the mouth. Several important aspects to consider include differences in how much air is used in the vocalizations of vowels in English and Japanese, and the fact that many English vowels include more than one sound, that in fact we tend to blend our vowel sounds, twist them, warble them even (particularly in relation to American Southern dialects, of which I'm guilty). My most common use of my artificial teeth, though, is in teaching the TH sound. Beginning speakers of English sometimes encounter difficulty with fricatives such as V (often confused with B), soft TH (often confused with S) and hard TH (often confused with D). Even many advanced students still need practice in their hard TH sounds because they tend to press too hard. This is typically because they don't realize the need for air to pass between the tongue and teeth to produce the vibration that we need for a softer and more natural voiced TH. I would encourage native speakers who are teaching pronunciation to analyze their own pronunciation and learn how THEY make sounds before teaching pronunciation to their students. If possible, get some teeth. In the future, I'd love to find a cool rubber tongue, because me fingers just look a little weird when I'm using the teeth. I've joked with my students that I'd like to build a puppet around the teeth, but I likely will never do that. It might make it difficult to see the teeth clearly! Starting this term, I'm going to be making a number of improvements to the Junior High School NELP Oral Communication Final Exams. 1. Comprehension. Students will be given a target sentence, followed by four choices: a, b, c and d. Students must choose the answer that has the same meaning as the target sentence. This is good for testing comprehension of vocabulary and grammar structures. 2. Response. Students will be given, alternately, a sentence or a question followed by four possible responses. Students must choose the response that best follows the question or statement they hear. 3. Completion. Students must choose the answer that best completes the target fragment. 4. Conversation. Students must listen to a conversation between two people and answer questions about it. 5. Short Talks. Students must listen to short passages such as statements, announcements, etc., and then answer questions about it. Parts 1 through 3 will be listening only. For Parts 4 and 5, the questions and answers will be in their test booklets. The first graders read a short article about The Great Molasses Flood of 1919. I first learned about this incident from the Grammar Sense textbook by Oxford, and I rewrote the article including details from various sources on the Internet. In 1919, a huge tank of molasses exploded, sending a 10 meter high wall of molasses racing down Boston streets. Interestingly, one my current high school second graders used this article as a recitation for the Reischauer Speech Contest several years ago. I showed my first graders her performance! I took the class outside and we measured from the third floor of the junior high building to give the students an idea of how high 10 meters would be. For contrast, I told them about the 1958 tsunami at Letuya Bay, Alaska, which rose a whopping 500m high! After that, we read "The Road Not Taken" by Robert Frost and talked about nature, choices, and so on. Next week, we're going to finish the term with O Henry's "The Gift of the Magi", and we'll talk about the true meaning of Christmas. The second graders read "Every Breath You Take" by Sting (and The Police). We had a nice debate about love, romance and stalking. The students were forced to take sides in a debate over whether the narrator of the song is merely romantic or a deranged stalker. Overwhelmingly, though, the students' personal opinion was for the latter! We listened to several covers of the song in various styles (by very talented York-based singer-songwriter Joe Venables, and by a very gifted and creative singer named Charlie Howitt). In class we noted how the voice can change the meaning and tone of the words. We also had a very productive discussion about romance and stalking, and we discussed the question: "When does it stop being romantic and start being scary?" The students expressed their ideas and opinions very well. We followed this with "The Night the Bed Fell", by James Thurber. The students did some very good small group discussions about amusing stories, and they asked one another some very good questions. I was very proud of their ability to listen to a student's story and then ask follow-up questions: a very important and useful skill to develop. We're going to end the term with the speech "I Will Fight No More Forever" by Chief Joseph. Although the speech is very short, it's very deep and there's a lot going on. It's a very good illustration of the importance of knowing the context of a work, because without knowing the history of the Nez Perce, it really loses a LOT of meaning. I was extremely fortunate this year to meet two very nice women from the Nez Perce Nation earlier this year, and I was finally able to ask about the correct pronunciation of 'Nez Perce' (which is actually a French name, though they use the English pronunciation). They explained a little about their history and culture, part of which I already knew from studying the Nez Perce for a high school research paper, ironically about the history of Chief Joseph's speech. I also learned that the Nez Perce are known in their native language as the Nimipu or Nimiipu (since the middle vowel sound is stressed). I was very fortunate to meet these very nice people. The third graders read "The Open Window" by H.H. Munro, a very funny story about a girl who is a compulsive liar. We attempted to discuss hoaxes and frauds, but unfortunately the students had a little trouble getting into the topic. More guidance by me would have helped tremendously. I do tend to just throw my students into a subject. We followed this with one of my favorite lessons in the entire curriculum: "You're Beautiful" by James Blunt. Here, we talked about parodies, and we studied various parodies of the song, including "You're Pitiful" by Weird Al Yankovic, "My Cubicle" by The Morning Sidekick and Jym Britton, and "It's Bloody Cold" by Jon Culshaw and The Dead Ringers. Students were then asked to make presentations. Possible topics or presentations included presenting another example of a parody (Weird Al naturally dominated, but we saw other parodies as well, including a very amusing parody of the Naruto theme which used English subtitles that sounded similar to the Japanese lyrics, but which made no sense) . One might think that merely finding a parody and showing it wouldn't be much effort, but several of my students came by the NELP room after school to look for parodies, and it was quite a challenge for them. Several students gave short speeches about parodies and why people do parodies, Finally, one student chose the advanced topic: writing their own parody of "You're Beautiful". We put on an instrumental version of the song, and this student SANG HER OWN SONG! It was a brilliant and funny song about a bald guy on a train. I was very impressed because it was a courageous and audacious thing to do. Next week, the third graders will finish the term with "The Christmas Truce of 1914", an article I wrote based on a number of sources. This tells the now famous story of British and German troops during WWI staging an impromptu truce on Christmas Day. It's a very sweet but sad story. In class, we'll be discussing the power of average people to make peace.